For a number of years we have conducted an Adult Study and Discussion Group at Holy Annunciation Orthodox Church in Brick Town, New Jersey. Whether reading the Holy Fathers, liturgical theology, or contemporary Orthodox writers, our discussions have always been open and questions welcomed; our premise is that there is nothing in our Orthodox Faith that is “out of bounds” for any believer to study; indeed, the building-up of the Faith among our membership is our primary goal. Our group now numbers fifteen participants, including four who belong to neighboring ROCOR (Russian Orthodox Churches Outside of Russia) parishes. At the beginning of the 2015-16 school year we devoted our study to the initiatives defined and prioritized at the 2015 Orthodox Church in America (OCA) All American Council. Having reviewed the documents and the valuable Power Point presentations available through the Council website, our members chose unanimously to engage themselves in the implementation of the initiatives in the local context of the Ocean and Monmouth County area. Having considered the various programs of service of interest to our members, including those of unique need in our greater neighborhood (such as natural disaster preparedness – our area was affected acutely by Hurricane Sandy and is still recovering), it was quickly concluded that there are already volunteer agencies active to “feed the hungry” and “clothe the naked.” For us to use our efforts to duplicate their good work was not a wise expenditure of our limited time and resources. The group resolved to research the faith-based and other organizations already experienced in these forms of outreach and to seek those who might best utilize our readiness to help. We were astonished that the opportunities we found were abundant and welcoming of our assistance. Furthermore, through these new friends, other means of outreach appeared and led us in further directions of service. Our first priority was to build upon the food collection drive for local Food Pantries. One of our members, a leader in the Girl Scouts of the Jersey Shore, invited us to prepare a Thanksgiving basket for distribution by the state-supported Food Pantry in Lakewood, New Jersey. This is an outreach of the Macedonia Baptist Church, which provides a meal six days a week, throughout the year, for those who struggle in the grinding poverty, need, and homelessness that characterize the lives of a very large proportion of the residents of this decaying city. Our group quickly assembled a basket and delivered it to the soup kitchen the day before Thanksgiving. Concurrently, another of our members, who is employed in the offices of Congregation Beth Torah in Ocean Township, Monmouth County, suggested a way to develop our food collection by utilizing a simple means employed by the Congregation in their own food drives. 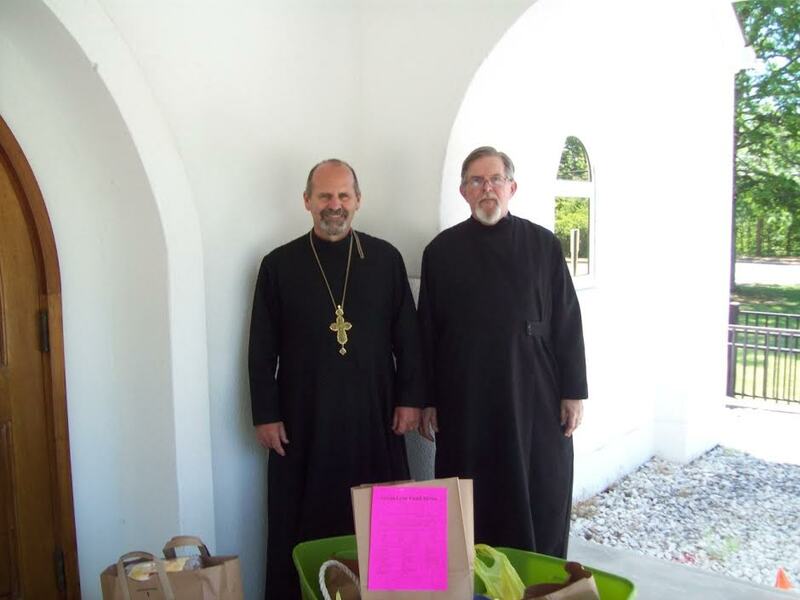 We adopted the plan of distributing plain brown grocery bags, with a detailed list of needed non-perishable foods stapled on each, to our parishioners as they were dismissed from the Divine Liturgy, on a few Sundays before the Feast of the Nativity. The intention was to simplify the task of contributing by 1) providing a shopping list, and 2) adding a bag for easier shopping and drop off in the vestibule. The results of this first-time initiative were overwhelming: by December 18 we had delivered two pickups and at least four carloads full of food bags to Lakewood. Our food drives will be held in alternating months throughout the year. In addition to the food items already on the “shopping list” we distribute, we have chosen to add items for which Food Stamps and WIC are not accepted, including all paper products, paper towels, and feminine hygiene products. Since these items are not covered by government assistance programs, there is a hardship that results for families in need. “Clothing the naked” – this initiative proved intimidating at the outset. We were all aware of the collection bins for old clothing, to be found in every shopping center parking lot. But we were also well aware that the majority of clothing deposited in bins does NOT find its way to the needy. It is, rather, collected by recycling companies and shredded into rags, with a tiny allowance donated to community service organizations. But once again one of our intrepid class members found a means to collect clean, wearable clothing; another member knew a source that could make best use of the garments. One of the members was picking up some dry cleaning at a local establishment. On a whim, she asked the proprietor what he did with clothing that was never picked up by the customers. Apparently his eyes opened wide, and he asked, “Do you have an idea? !” She explained the collection program, after which he excused himself to make a phone call, and then asked her to come back at 6:00 that day to pick up the clothing. It turned out the generous proprietor had called a friend in the business who had a similar backlog, and she went home with her car stuffed with cleaned garments on hangers and covered in plastic. Another member went out visiting dry cleaners and had the same results. Trays of cookies obtained from the Parish Cookie Walk were delivered to the donors as a “thank you.” And the search for more clothing continues. Afghans crafted by a member of Annunciation Church who reposed last year were recently distributed to a Women’s Shelter in our area. Also planned for this year is the addition of household items, kitchen utensils, and items of furniture to the list of donations we collect for Navy Relief. The Rabbi at Congregation Beth Torah approached us through our member in the office there with a dilemma and asked for help. Each family in the congregation was asked to contribute a toy for distribution to needy families at Christmas. It was nearly Christmas and everything that could be donated had been distributed. But there still remained a quantity of toys and other organizations couldn’t take any more so close to the holiday. Could we possibly help by taking the toys and seeing they got to children who were in need? Enter the Girl Scouts from Jackson. They had a small list of struggling families they bought gifts for each year, and the toys from the temple were added to the “Secret Santa” distribution. There are some Mexican immigrant families in Lakewood whom the Scouts look after, including families who cannot afford any gifts at all for their children. So, after Nativity Eve services at Annunciation Church, with a car full of toys and real sleigh bells jingling for atmosphere, the troop made their rounds. The Children of Congregation Beth Torah recently finished a project of making children’s scarves and passed them on to us for distribution. The Girl Scouts will assist us in distributing them to those in need. The relationship between our group’s outreach projects at Annunciation Church and those initiated at Congregation Beth Torah, although still in its formative stage, promises to lead to further cooperation in care for the needy in the Shore Area. A program intended specifically to assist elderly members of the Annunciation Parish with winterizing their cars, which was named “Car Care Clinic,” was devised by a member of the class, assisted by other class members. The Christmas travelling season was then at hand, and he was concerned that tire pressures be correct and fluids topped off before parishioners drove any distance. Parishioners were asked to surrender their car keys on their way to Coffee Hour, the crew went to work, and when the drivers were ready to go home their cars were good to go. For supplies, our member went to his favorite garage to stock up on windshield washer fluid, antifreeze, and other necessities needed. When he attempted to pay for it all, the owner, a friend of his, asked why he wanted so much. When he explained the project, the owner accepted a $5.00 payment and told him to take whatever he needed. And he thanked us for the opportunity to help the Church. Having learned a great deal in the past couple of months, the class will continue its work of Expanding the Mission. We believe God has given us a great gift in sending us to so many fine and earnest members of our community. And we have been enabled to lay the groundwork for a positive, friendly, and generous impression of what Orthodox Christians are like. [Jacob’s Well, publication of the Diocese of New York and New Jersey, Summer 2016, pp 22-23] Reprinted with permission. Father Deacon Alexander Smida is an alumnus of Saint Vladimir’s Seminary and has been active in Orthodox religious education for over thirty years. He also lectures on the Orthodox Faith to community groups, and is assigned to Holy Annunciation Church in Brick Town, New Jersey.